We've upgraded our Grab a Grand Game cash grabber game from the rather ordinary inflatable type (which is still available if really preferred) to the stunning new version pictured below. With its smart chromed aluminium frame, clear perspex panels, large digital display timer and branding opportunities its an attention grabbing game that's perfect for promotions and corporate events. 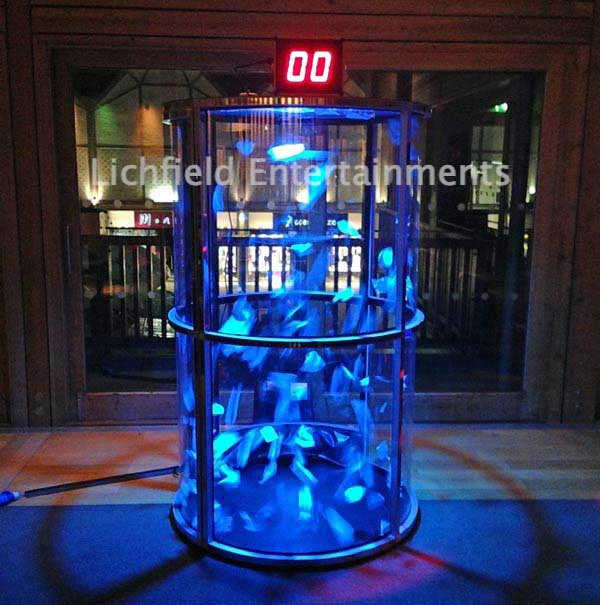 Grab a Grand game is a one player game where the participant stands inside the enclosed cylinder and tries to grab as much fun money, promotional vouchers, or if running in 'Ball-Nado' mode coloured balls, as they can within a certain time limit as they're circulated around the enclosed chamber by a high powered blower. When their time is up the quantity of cash or balls grabbed is placed on some super sensitive digital scales that will provide a result accurate to within a single note. 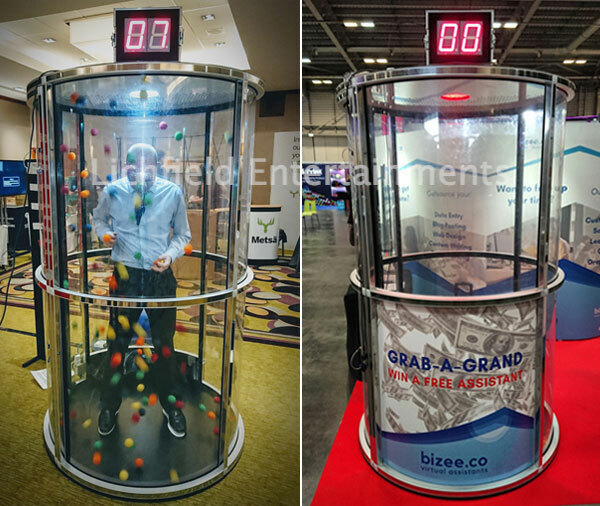 The Grab a Grand game is perfect for brand activations and promotions, exhibitions, or just as a fun interactive attraction. Panels can be branded for you if required for a small charge. The game can be supplied with a friendly member of our staff who will ensure the game runs smoothly or supplied unstaffed if preferred. 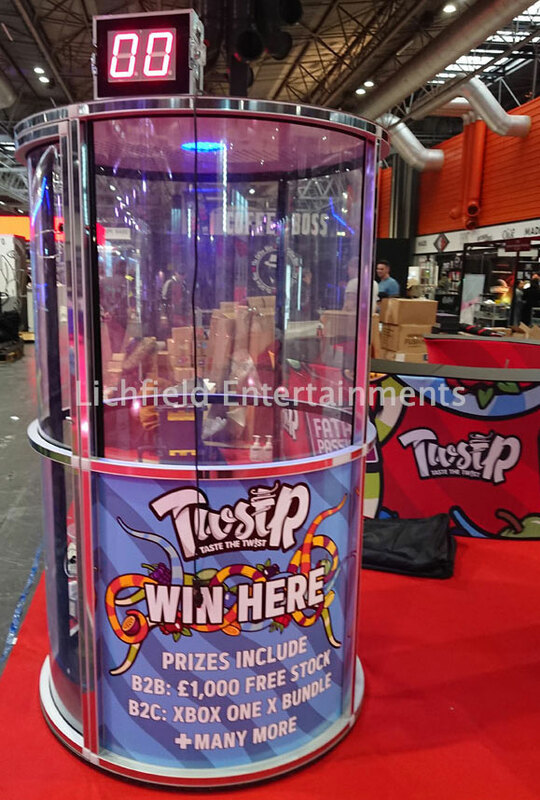 If you are looking for a Grab a Grand or Ball-Nado as an attraction for your stand at an exhibition at the NEC Birmingham then we're only 30mins away and offer a 3 day unstaffed hire for £750+vat for this venue. If you would prefer it staffed or require it for a different period of time just ask for a revised quote. Our Grab a Grand game requires an operational area of 6x7ft with a height clearance of 8ft. A 240v electric supply will be required. The game can be hired from a few hours to a few days. The game is normally supplied with a friendly attendant who will run operate the game for you and total the results of each participants attempt. Unstaffed hire is also available if required although we still need to install the game ourselves. We hire out our Grab a Grand game to events throughout most of the UK including Birmingham and the Midlands, Buckinghamshire, Cheshire, Derbyshire, East Midlands, Gloucestershire, Leicester, London, Manchester, Nottingham, Oxford, Shropshire, Staffordshire, Wales, Warwickshire, West Midlands, Worcestershire, Yorkshire. If you have any queries, questions, or would like to hire the game for your event please click here to enquire and we will do all we can to help.